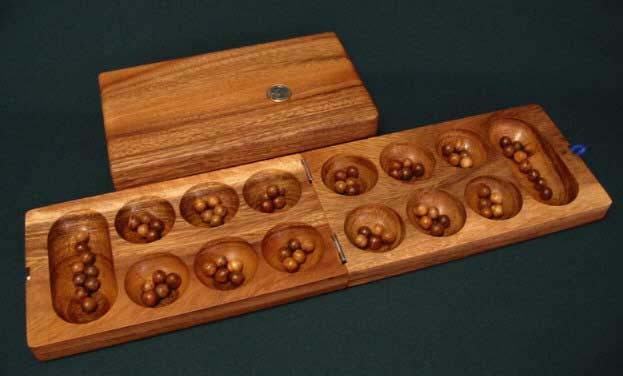 An arithmetic strategy game, originally from Africa. For 2 players aged 7 years - adult.. The object is to win more playing pieces than your opponent. This is one of the most popular games ever invented. It’s played throughout Africa and Asia and the Caribbean. Quickly gaining converts from every corner of the world due to it’s inclusion on the games menu of some mobile phones. Playing the real thing is much more fun though as nothing can reproduce the tactile nature of handling the wooden beads. Folding board with matching wooden playing pieces (spares included). The rules for 3 different ways of playing are included. Wood type -: Samanea. Teak playing pieces. Packaging -: Transparent PVC. Dimensions 130 x 485 x 24 mm. Weight 900 grams.